Hennepin Health and Hennepin County had the privilege of participating in the National Health Care for the Homeless Council’s 2018 National Health Care for the Homeless Conference and Policy Symposium. 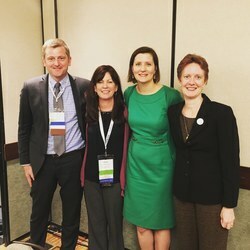 The four-day conference was held on May 15-18 in Minneapolis, and presenters and attendees ranged from clinical staff and researchers to policy and advocacy experts. Ross Owen, Hennepin County Health Strategy Director, Dr. Danielle Robertshaw, Hennepin Healthcare Senior Medical Director, and Marie Zimmerman, Minnesota’s Medicaid Director, presented on Hennepin Health’s Accountable Care (ACO) structure (a partnership among Hennepin Health, Hennepin Healthcare (formerly known as Hennepin County Medical Center), NorthPoint Health & Wellness Center, and Hennepin County’s Human Services & Public Health Department), and how together these ACO partner entities form a system of care that coordinates members’ medical and behavioral health care, as well as addresses social problems through a broad network of community providers and social service agencies. Owen, Robertshaw and Zimmerman also led a session titled, “Expanding Access to Housing and Health Care through Policy and Community Collaborations,” which focused on the need to identify and address an individual’s homelessness, along with other pertinent social factors such as housing, and connect them to resources that can provide additional support. The presentation was well received and a subsequent case study featuring Hennepin Health was published. 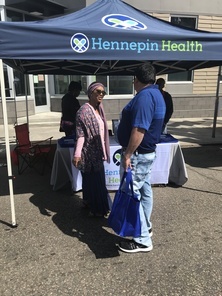 Kaiser Health News recently featured Hennepin Health and Minnesota Medicaid in an article that discusses the Minnesota Department of Human Services’ efforts to ensure that all Minnesotans receive high-quality, cost-effective health care. The article, “As Medicaid Costs Soar, States Try A New Approach,” was also featured on CNN Money. Two studies that found providing integrated medical care and social support services led to increased use of primary care among very low-income adults in Hennepin County, Minnesota who were enrolled in a Medicaid accountable care organization between 2012 and 2014 were recently published in Medical Care Research & Review. The studies were conducted by researchers from the University of Minnesota School of Public Health; the University of Minnesota Clinical and Translational Science Institute; Hennepin Healthcare; Hennepin County; and the University of Michigan. Somali Independence Day on June 30 – Celebrate with music, food, games and free health screenings at this annual family street festival! Festivities take place on Lake Street between Blaisdell and Stevens Avenues, 1:30 p.m. to 8 p.m.
Twin Cities World Refugee Day on July 15 – Immerses attendees in an artistic, culinary, and social experience that expands intercultural understanding by building human connections, and improving knowledge of immigrant and refugee issues. Local organizations dedicated to providing opportunities and improving the quality of life for immigrant and refugee communities will be onsite. Festivities take place in Loring Park (Minneapolis), 12 p.m. to 6 p.m. The 28th Annual Minnesota Festival for Fathers & Families on August 11 – Celebrate father-child-family relationships with food, families and fun! Information about family-oriented community resources that provide services to fathers and families will also be available. Festivities take place in North Commons Park (north Minneapolis), 12 p.m. to 4 p.m.